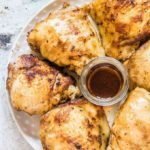 This golden crunchy easy baked Parmesan Crusted Chicken is ready in under 25 mins so it makes a great weeknight supper or brunch treat. Serve with some baked fries, a simple salad or some mac and cheese. Post includes Weight Watchers points. 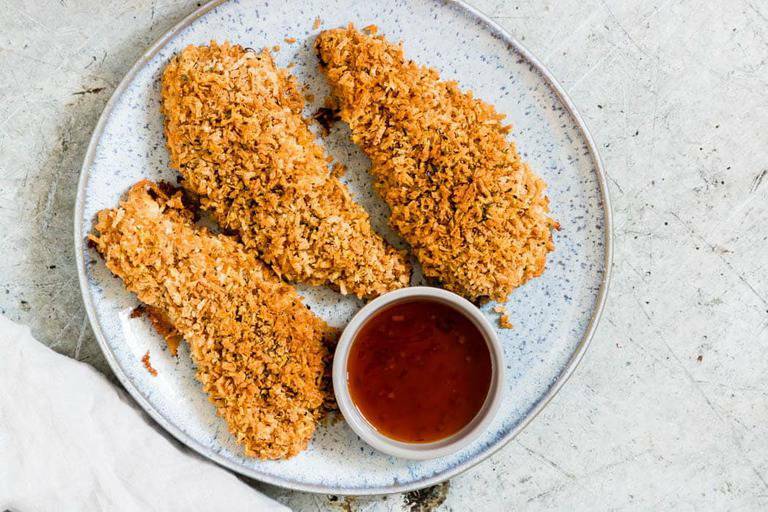 Who is up for some crunchy baked crispy Parmesan Crusted Chicken? This is one of those incredibly easy recipes. 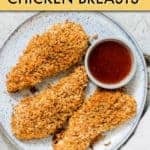 Yes I know you get that a lot but it is a really easy and simple oven baked boneless chicken breasts recipe to whip up. What is Parmesan Crusted Chicken? What Cheese to use for Parmesan Crusted Chicken? What to Serve with Parmesan Crusted Chicken Breast? 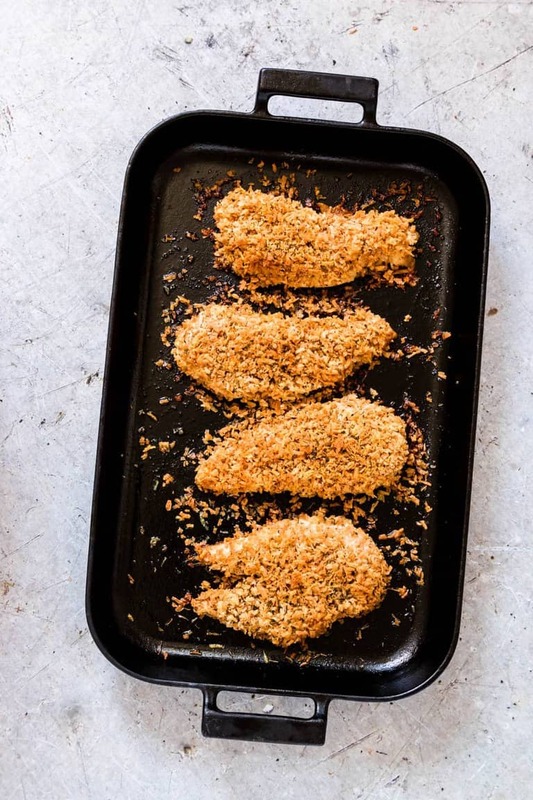 Parmesan Crusted Chicken is chicken breast coated with a mixture if crispy breadcrumbs with Parmesan and herbs and baked till perfect. Adults and kids alike love it as it comes out of the oven all golden and crunchy on the outside but deliciously tender and juicy on the inside. You can’t help but reach for one, then another one, then just one more. 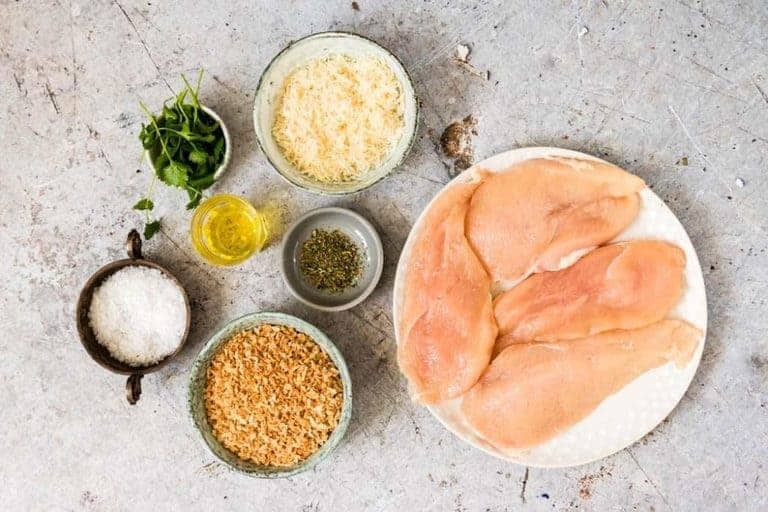 You only need 6 pantry staple ingredients and less than 25 mins to the most flavourful Parmesan Crusted Chicken Breasts you will ever have. And I show you how with step-by-step photos so you can make this quick weeknight dinner or brunch dish. I recently hosted a brunch for a few almost ‘long lost’ friends. Long lost to me because blogging, whilst fun and I love everything about it, can be so, so, so time-consuming. 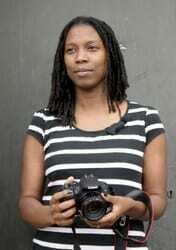 There are recipes to test, images to take, post to write and promote, emails to reply to, research to do etc. So, I find myself seeing friends less and less. During the brunch, I served this baked Parmesan Crusted Chicken, some baked sweet potato fries and this Lemon Drop Martini. It took about 20 mins of hesitant getting to know each other again conversation, for us to get right back into the swing of things. And 3 hours later with only a few straggling sweet potato fries remaining, we hugged each other goodbye with promises of more dates like these to come. It is extremely easy to make this Parmesan Crusted Chicken. 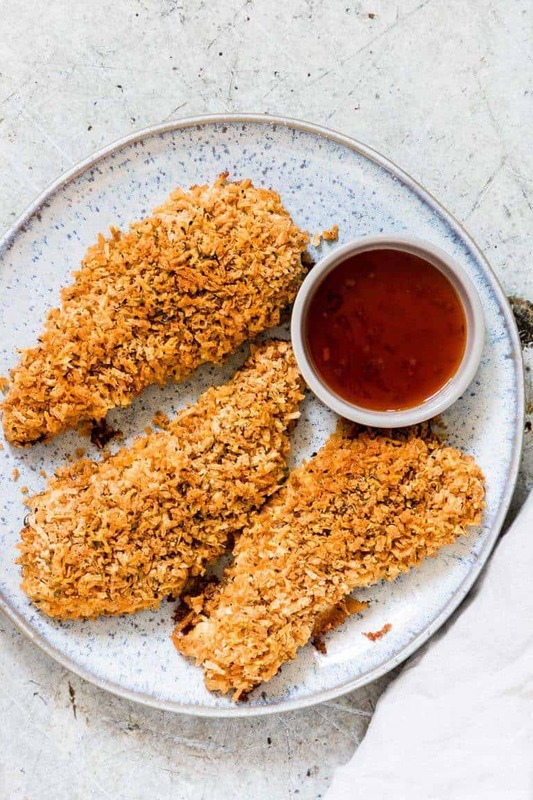 However, the secret to this recipe is using panko breadcrumbs. These are lighter and airier compared to regular breadcrumbs, which means they absorb less oil and end up crispier. Step 1. So first thing is to mix together the olive oil and chicken. Step 2. Then combine the breadcrumbs, Parmesan, dried herbs and salt (if using) and decant this mix on to a plate. Step 3.Then coat the chicken with the breadcrumb mix and bake in a hot oven for up to 25 mins. Step 4. Bake in a hot oven for up to 25 mins. Enjoy your Parmesan Crusted Chicken! 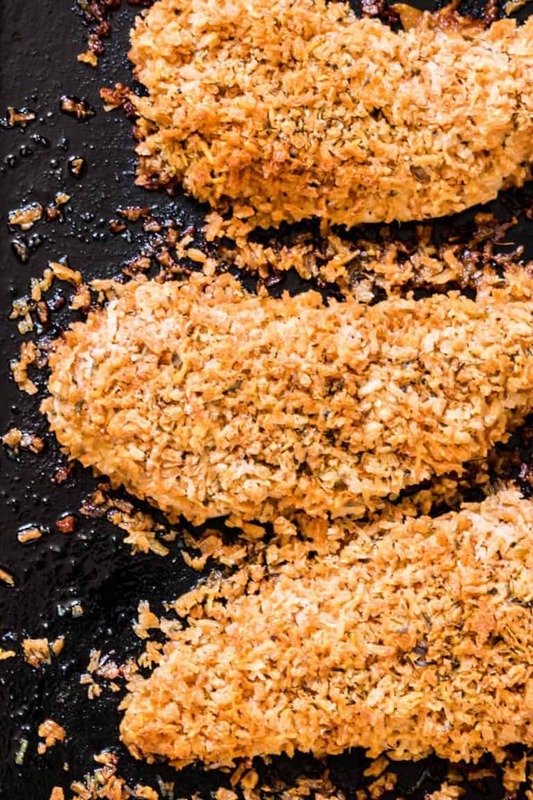 You can fry your Parmesan Crusted Chicken very easily. Simply coat a pan with some oil and fry the chicken for about 3-5 mins on each side till golden and cooked through. A quick note on what cheese to serve with Parmesan Crusted Chicken. Of course, the answer is in the name aka Parmesan cheese. The important point is please try to grate/shred the cheese freshly from a block just before you need it. And do grate /shred it as finely as you can as the finer grated cheese will encrust the chicken better. Chef’s tip. Toast the panko breadcrumbs a little bit before adding them to the mixture. This makes sure that you end up with a lovely golden coating. Yes, it is not necessary but it is so, so worth it. Chef’s tip 2. You can put the breadcrumb mixture in a bag, add in the chicken and shake away. Kids totally love doing this bit. Chef’s tip 3. Make sure you halve your chicken breast for this recipe so they cook quicker but you also get more flavour per surface area of the crust. If you can’t halve the chicken breasts, then please do flatten them first with a meat tenderiser. Need ideas for what to serve with Parmesan Crusted Chicken Breast? Well, these recipes below are a great starting point. Instant Pot Mac and Cheese. Super Easy Instant Pot Mashed Potato. You can also make Parmesan Crusted Chicken with mayo. 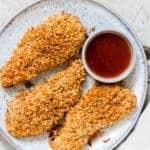 Simply combine your favourite mayonnaise with the parmesan cheese, top the chicken breast with the mayo-cheese mixture, then sprinkle on some breadcrumbs, herbs and seasoning and bake in a hot oven until the chicken is cooked through. Easy peasy and simple. I have not been paid to advertise this video. I just think it is really useful. 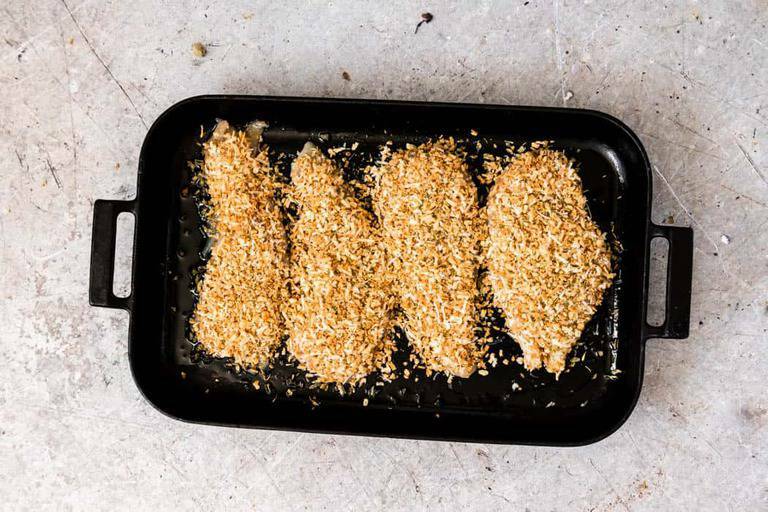 To make a low carb Parmesan Crusted Chicken Breast recipe, you would skip the breadcrumbs. Mix mayonnaise with cheese and herbs, coat the chicken and bake. Take the chicken out of the fridge 3o mins before needed and bring back to room temperature. Preheat oven to fan-assisted 180C /200C / 400F / gas 6. 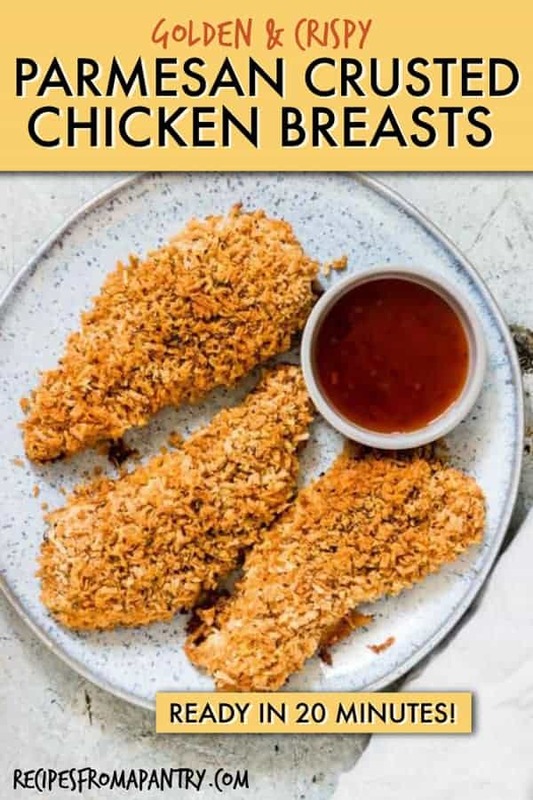 Place the breaded chicken breasts on a wire rack, over a baking tray (so that the bottom does not get soggy) and cook for about 10-15 mins or until warmed through but the chicken not overcooked. 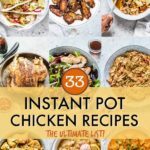 If you like chicken then why not check out these chicken recipes below. Golden and Crunchy Air Fryer Chicken Breast. Thank you for reading my Parmesan crusted chicken recipe post. And please come visit again as I continue dreaming up recipes, traditional African recipes, African fusion recipes, Sierra Leone recipes, travel plans and much more for you. Thanks for supporting Recipes from a Pantry, UK food blog. Don't forget to tag #recipesfromapantry on Instagram or Twitter if you try Parmesan Crusted Chicken! It is really, really awesome for me when you make one of my recipes and I'd love to see it. You can also share it on my Facebook page. Please pin this recipe to Pinterest too! Thank you for reading Recipes from a Pantry. Preheat oven to fan-assisted 200C / 220C / 425F / gas 7 and line a baking tray. Add the chicken and olive oil to a bowl, and mix until the chicken is coated with the oil. 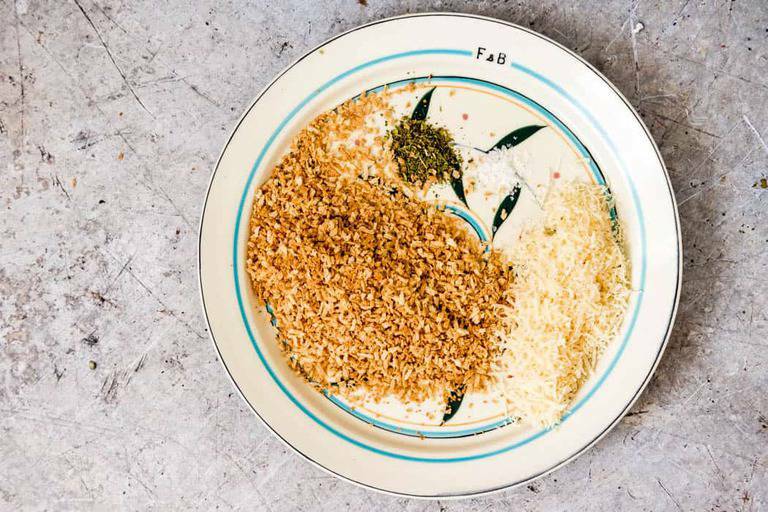 Mix together the panko breadcrumbs, parmesan, herbs, and salt on a rimmed plate. Add the chicken pieces one at a time to the plate and coat evenly on both sides with the breadcrumbs. Transfer the coated chicken to baking sheet and sprinkle on the remaining panko mixture. Bake for between 20 to 25 mins or until the breadcrumbs are golden brown and the chicken is cooked through. Chef's tip. Toast the panko breadcrumbs a little bit before adding them to the mixture. This makes sure that you end up with a lovely golden coating. Yes, it is not necessary but it is so, so worth it. Chef's tip 2. You can put the breadcrumb mixture in a bag, add the chicken and shake away. Kids totally love doing this bit. Chef's tip 3. 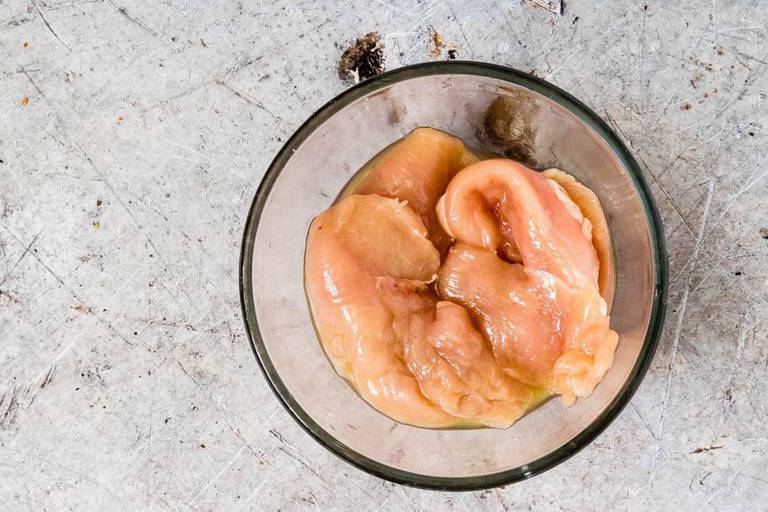 Make sure you halve your chicken breast for this recipe so they cook quicker. If you can't halve the chicken breasts, then please do flatten them first with a meat tenderiser. 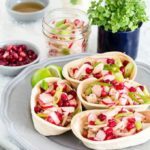 I like the fact that there are only a few ingredients needed to make this recipe and all of them are easily available ones, usually found in everyone’s fridge. Looks great too! It is defo a great pantry staple recipe. This chicken looks fantastic. I will have to make it soon. Parmesan and panko sounds like a perfect combination for a tasty crunch. Im a sucker for a crispy coating. Especially if there is parmesan in it! Love the recipe! Love this! 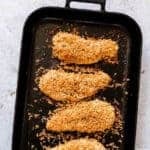 I do this with fish sticks — they’re so much better homemade and it looks to be the same case here. 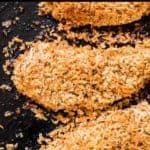 The panko crumbs give the perfect crispiness! I love to make these for dinner one night! YUM! 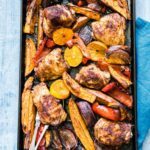 My family eats so much chicken, and this looks like a yummy way to change things up! Mmm it reminds me of my holiday in Sicily … I can’t wait to try it. It’s perfect as I have the breadcrumbs waiting to be used up. Recently, my husband and I were visiting his colleagues, now the truth is they do not work together .. but it does not matter. 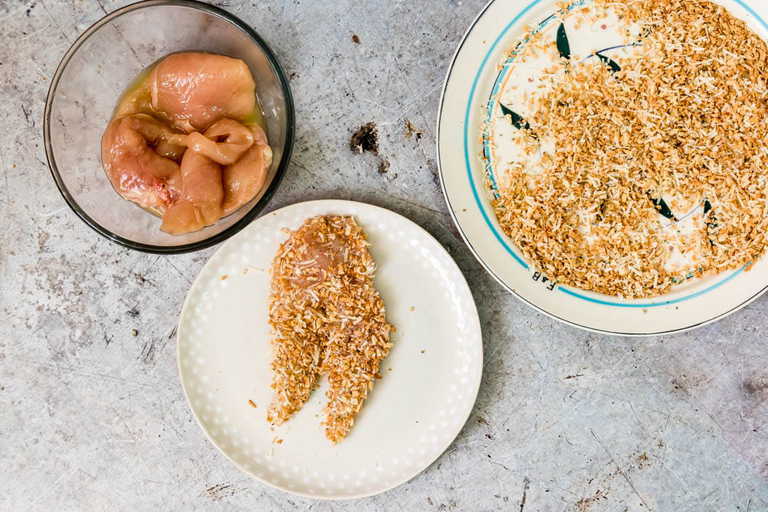 So, as a main dish on the table were these chicken breasts in bread crumbs. Real jam!